I like the colour of Zaria’s food, so I thought I’d take photos of her every day meal for a few days. She has so far been given mainly home made cereals (brown rice, quinoa, millet) with vege or fruits, and occasionally, we add some Earth Best Whole Grain Rice Cereal when we need to thicken her fruit or vege puree. She loves pumpkin, apple, pear, sweet potato, banana, papaya; accepted potato, carrot, cauliflower, spinach, plum, brocoli. She refused avocado twice, using her tongue to push it out and turning away from the spoon. We started with cereals (brown rice, millet, quinoa) and then later added one fruit or vege to her cereal. Sometimes we just give her 1 type of fruit or vege puree, e.g. puree pumpkin, puree papaya or mash sweet potato or mass banana. Later, we started mixing her favourite item to her vege cereal so that she will enjoy it more, e.g. brocoli + apple cereal; cauliflower + pumpkin cereal. She enjoys meal time, opening her mouth eagerly, shouts out when the feeding is not quick enough. 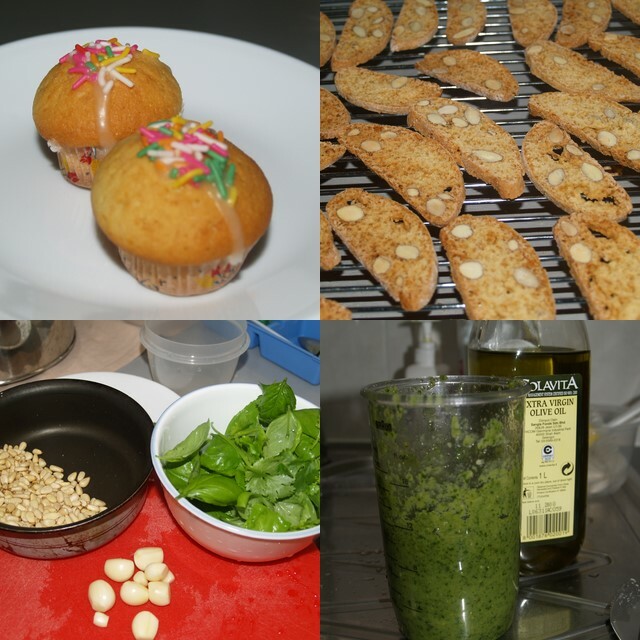 Besides paying attention to Zaria’s food at home, I’d also been keeping myself busy in the kitchen with some baking and others. Let the photos say it. Every body is kept happy with some home made food. very pretty colours I must say, blended food. I wonder how my lormaifann will turn out? all gunky brown, no doubt… lol! oooh, biscotti! I’ve been meaning to make some, but quite a bit of hassle, hor. which recipe did you use? Pretty pretty pots! Quick quick! I need your number before it’s too late!!! ZMM : Oh yah oh yah.. have been so bz.. give you a tinkle soon. So cool! 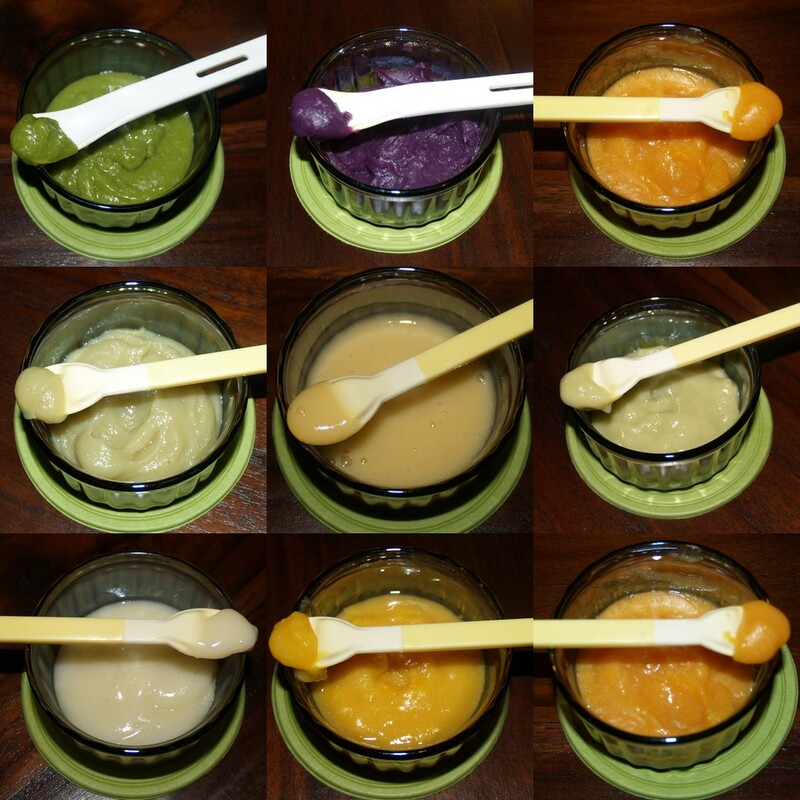 I salute you for taking the time to make home made baby food! ZMM : I get the maid to do it. I just did the first few rounds, and later, it’s all her work. I just tell her what to put. The puree certainly looks very yum! Do all babies need to keep to a vegetarian meal til they turn one? ZMM : I did for Zara and will do for Zaria. It’s just to play safe so that they don’t get any allergy. ZMM : Zaria very wai sek, I think as long as it’s not absolutely yucky, she’ll eat it. I love avocado, but too bad she didn’t like it. Wahh…so colourful! Good for you that Zaria is wai sek, gobbles all her food. Unlike Shayanne, 4 things she does when feeding time, try the food for a few spoons, clam her mouth shut, turn away from the spoon and arch her back and cry…..real hard time for me to feed her. ZMM : Maybe she prefers milk over solids. Maybe you can start feeding her with your finger? Let her get used to it first. It looks like my clay mask. Full of ‘nutrients’. I wonder how it taste aa?? ‘ham ham’ or ‘tiam tiam’? ZMM : It just taste natural.. no additive. Cauliflower tastes like cauliflower, apple tastes like apple. ZMM : :O But you have maid. Maid can cook if mama no time. What about quick instant cereal? But the rest, I did it myself. interesting and colourful food for lil zaria .. hmmm must learn to this in future ..
ZMM : Come back for more. ZMM : They are quite easy to make.. just need a bit of effort. I bet Zaria has strong immune system.. drinking mama’s bm and eating nutritious home made cereals. When do u intend to introduce to her lumpier food? ZMM : I hope she has strong immunity too, these are all my intentions. She’s eating ‘thicker’ food already.. slowly, it’ll get thicker and lumpier. my sis has a 6 mths old baby and she actually learned to make her homemade cereal from you. well of course minus the breastmilk. now if you dont mind me askin, how to add those fruits and veges in? just blend them with a lil water then add to the cereal? ZMM : Cut them into small pieces, covered with water (just enough to cover the pieces of vege/fruits up), simmer for a while. Wait till it’s cool, then blend in together with the cereal, and boil the whole thing over small fire, until cereal is cooked (~10mins). I think you can also blend the vege/fruit raw and then cook with the cereal, that way more nutrient will retain. ZMM : You sure? Next time you come to Malaysia, I’ll cook this for you. Haha. Now you make me look so useless. 😛 All I gave Belle was gerber puree veg. Your baby food sooooooooooo colourful n tempting. Im from India n have 2 kids whom I looooooooooooooooooooooooove. Do you cook them in a special way?????????? wow… you terra la!!! yr bb food looks so colourful. the last time oscar oni had either “yellowish = cereal and potatoes” or “greenish = blended spinach and cereal”.. so after a while, oscar refuse cereal completely!! and i have tonnes of stock cos i kiasu went and bought alot during some sale!! wa… biscotti, i like… so yumm. hey i am now trying yr salted egg thingy la. wish me luck. ZMM : Salted egg, sure won’t fail.. Don’t worry. Unless your eggs are not fresh, but that’s something you can’t control. All the best! ZMM : Eh, but you are the one who told me all the different cereals woh..
Well done ZMM. So many varieties. ZMM : It’s still not too late to add variety now. hey, just wondering, did zaria’s paed recommend a daily dose of egg yolk? ZMM : Nope, he didn’t. I don’t think I’ll introduce egg to her so early, but I know in China, babies take a lot of egg yolk when they started solids. creamsoup.. just change milk with breastmilk lor, and omit sugar. I donated my breastmilk to a mummy too, 6 liter of frozen milk..
ZMM : For adults or for your son? How colorful! No wonder she loves it! Pleasing to the eye and tasty too! ZMM : Get maid to do.. get maid to do. ZMM : Psst.. you want kopi SUSU or not? Lots of frozen milk still, can spare you some. Kakaka. ZMM : You are too busy..
Lovely colours. I never bothered with that for Gavin when he was younger. Too much work and that time got no maid. So just made him chicken or fish porridge mostly. ZMM : Oh.. I’ll do that later too.. chicken and fish porridge.. but only after she’s 1yr old. wow.. u are really cook chef. how do u get the cereal so nicely blended? have to agree with vien…makes me look useless too. 😉 …i went for shortcut as well, all bottled food. bad mummy. I like your home made food for zaria, very colourful and so attractive that want to have a try. ohhhh ur puree look so appetizing. no wonder ur girl love to eat. wow..different kinds of baby food and it looks like ice-cream…i guess you baby must love eating your food..
Looks nice.thanks for the posting. I have some doubts if the food contains any colors it will not b good for baby.There will be a chance to affect baby health badly.I noticed that it contains fruits it is essential for nutrition.It is good to give organic food for baby it helps the development in each phase.I found http://www.gerber.com/Articles/ is useful to find essential information on baby food.